I first came to Bali in 2007 and again in 2009. These trips were spent partying in the Bounty (a seedy club) every night on my first trip and on my second trip I barely left my 5 star hotel except for massages and food. I felt like I was lying if I said I had been to Bali because I had barely experienced anything. Bali, Indonesia is our first port of call on our 4 month backpacking adventure around South East Asia. For most Australian’s due to it’s close proximity and currency exchange, Bali is a package tourist destination where we go to stay in 5 star hotels at affordable prices, have massages and spa treatments, drink cheap beers and cocktails and work on our tans. As this had been me on previous trips, I was a little confused as to how we would do Bali on a backpacker budget. Sure, Bali is cheap, but is it backpacker cheap? Are there hostels? Can I still get massages and get my nails done? Can I enjoy sunset drinks like everyone else? The answer is yes. 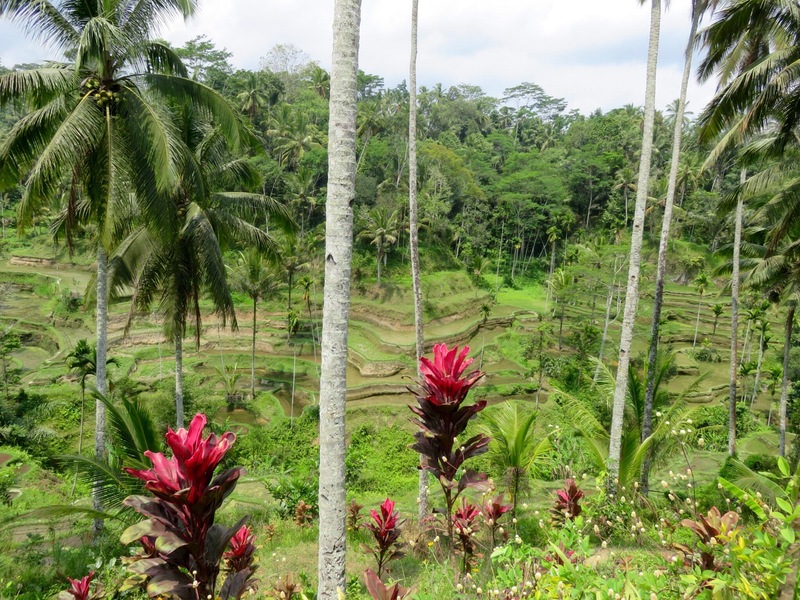 Here’s my experience of Bali on a budget: Ubud..
Ubud was our first stop. After watching the famous film ‘Eat pray love’ I had been dying to visit Ubud (the place where it was filmed) and it sure didn’t disappoint. I fell in love immediately. Ubud has an artsy, tranquil, hippie kind of vibe. It’s much quieter than the South of Bali, but still has enough going on to keep you entertained. 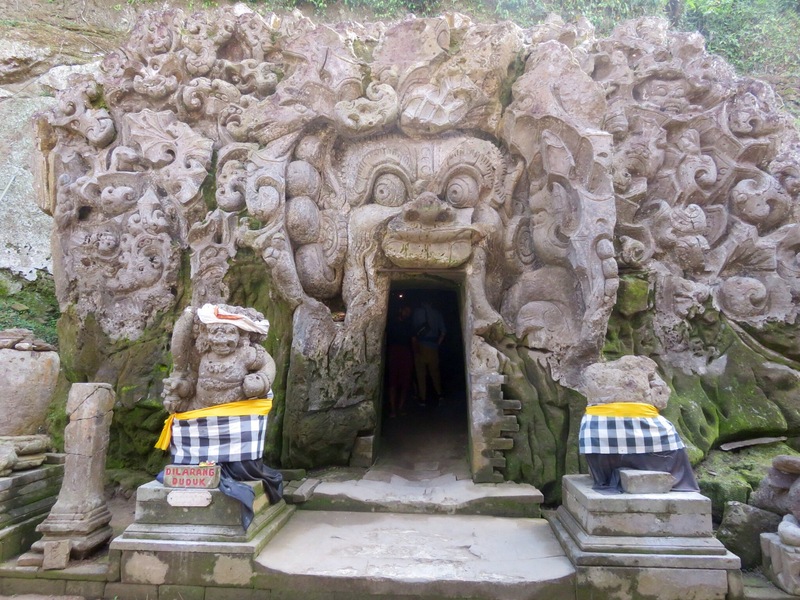 There are plenty of delicious restaurants to eat at, art displays, temples to visit, yoga, amazing markets filled with handicrafts and clothing, cooking classes, traditional Balinese dancing shows and a Monkey forrest to explore. We stayed at In da lodge hostel. There are plenty of homestays and cheap hotels to stay at as well as Villa’s and fancy hotels, but I fell in love with In da lodge hostel. 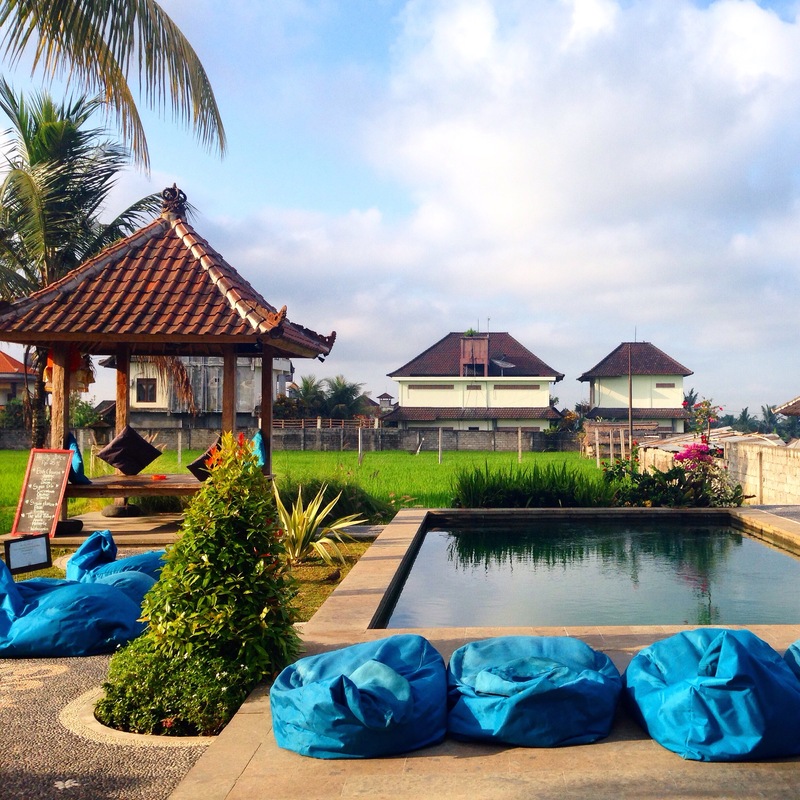 Located on a quiet street with a beautiful pool, surrounded by bean bags and over looking a rice field how could you go wrong? With dorms for $8 and privates for $28, this is a backpackers paradise. Be sure to book ahead, this place fills up fast! We ate at quite a few different restaurants on our 4 day stay, but there were two that stood out for me. 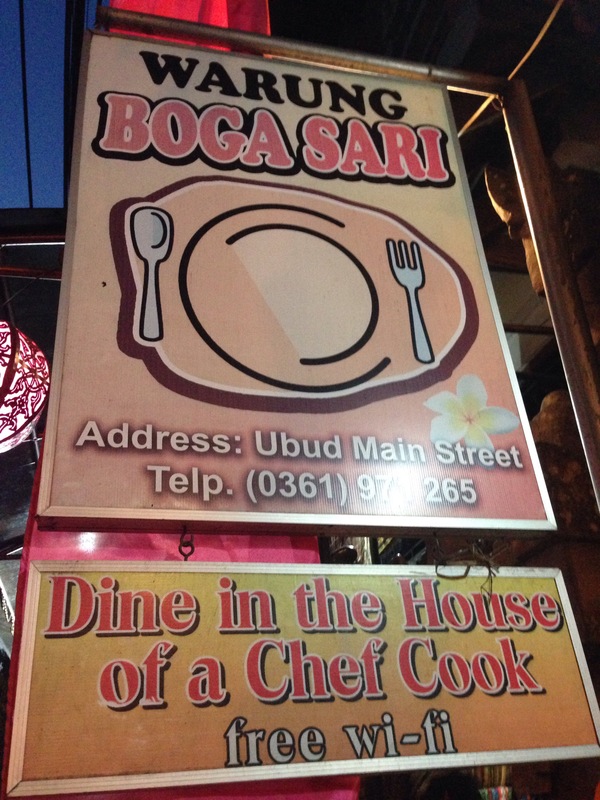 Firstly, Warung Boga Sari. You are literally dinning in the front of someones house that has be converted into a small restaurant. Some of the tables are low to the ground with cushions on the floor for seats for an even more authentic feel. I had a huge vegetarian curry and a beer for just $4 AUD. 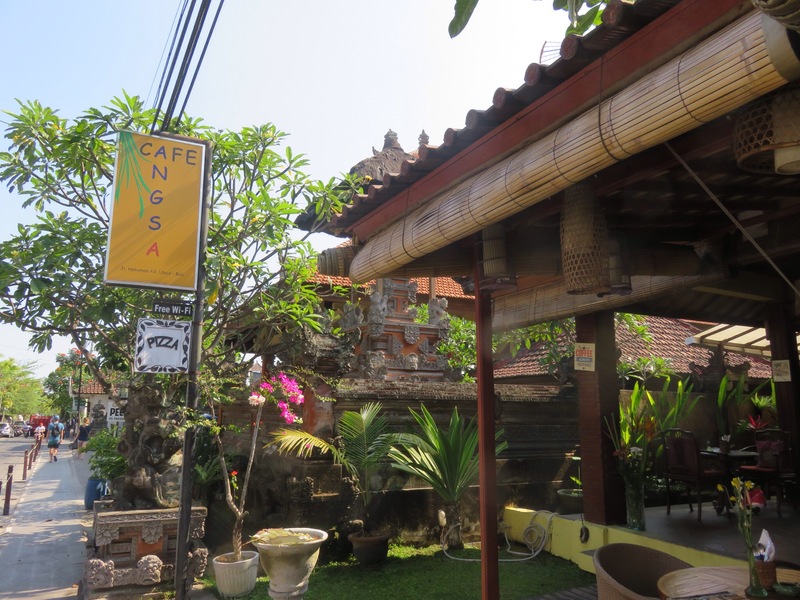 Secondly, Cafe Angsa. This place costs a little more, but for the view it’s totally worth it. It over looks a beautiful rice field which makes a perfect backdrop for a nice lunch. Again, it has tables low to ground as well as normal ones. 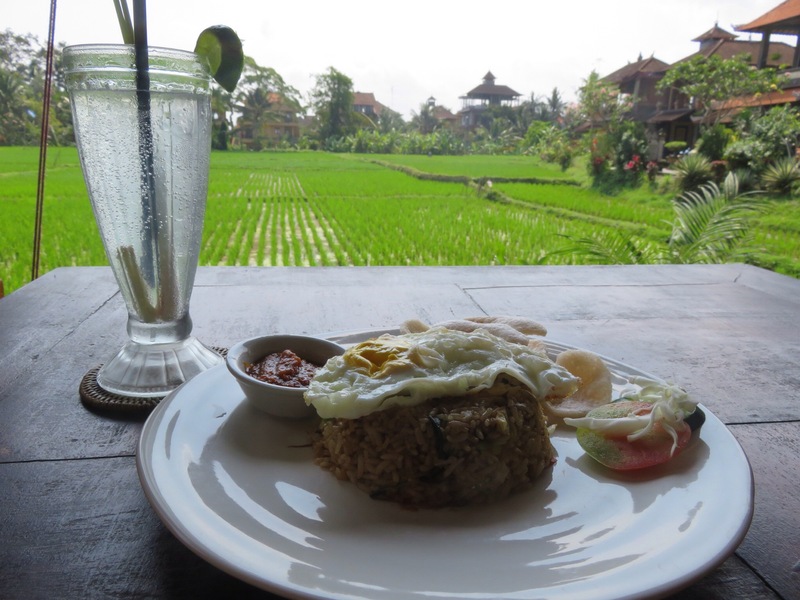 I had a Nasi goreng (typical Balianense rice dish) and a lemongrass, ginger soda for $6. 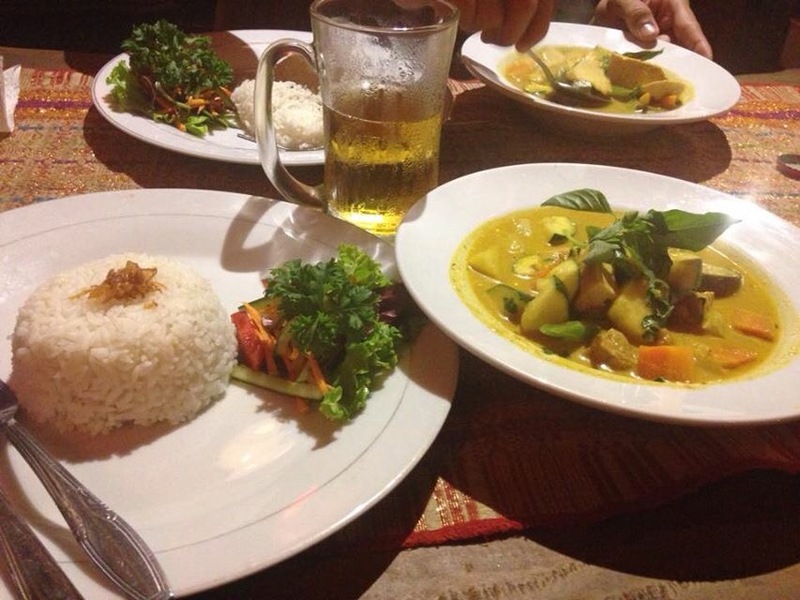 You can still eat well and plentiful for a small amount of money in Ubud. 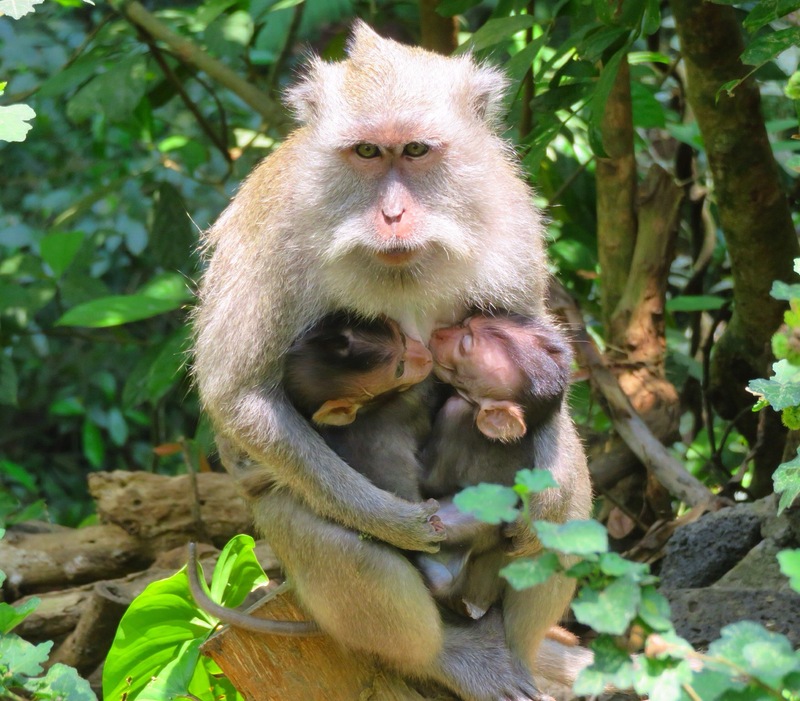 One of my favourite things to do in Ubud was visit the Monkey Forrest. 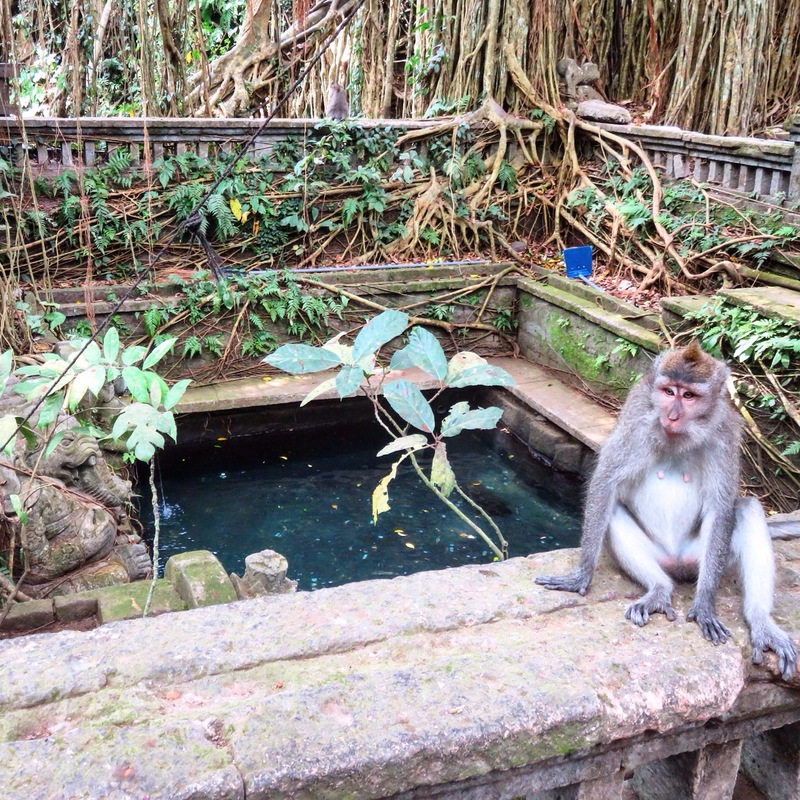 The Monkey Forest is a nature reserve and contains a sacred temple. It is also the home to quite a few Balinese long tailed Macaque monkeys and has become a tourist hot spot somewhere along the way. If you were to Google to Monkey Forest, it would come up with a few blogs containing ‘horror stories’ of the monkey’s attacking people and stealing their stuff. Do not let this deter you. As long as you follow the rules, you will be fine. There is a lady at the front selling bananas to give to the monkey’s, I would strongly advise against this. Sure, it seems fun to feed a monkey and perhaps get a cool photo doing it, but this is when the monkeys are going to jump all over you, steal your stuff and possibly even bite you if you scare them. We saw one poor tourist get bitten whilst we were there. At first I was a little frightened of the monkey’s. I had never been this close to them before. They were running all over the place, stealing bananas and jumping on the shoulders of unsuspecting tourists carrying bananas and water bottles. I soon got used to them (sort of) and spent my time snapping adorable pictures of them with their babies and playing together. Tom and I also spent a fair amount of time trying to get the perfect monkey selfie (unsuccessfully, I might add). It seems like the monkey’s have a pretty good deal going on there, roaming freely around a lush forest, waiting for their tourist servants to come and feed them bananas! Another activity I thoroughly enjoyed was doing a tour to surrounding areas. We usually don’t like doing tours as we feel restricted and we like to do things on our own time, but after a little bartering with a local tour company we managed to secure a private tour of the famous rice fields, a view point of Mt Batur (volcano), a coffee tour and a tasting of Kopi Luwak coffee, a visit to the temple called Goa Gajah (elephant cave) and the Holy spring temple called Tirta Empul where people go to cleanse themselves. We got this all for just $40 for the two of us. We saw and experienced SO much and it was so nice having a private tour so we could do things on our own time. $40 is an amazing deal for this unforgettable experience. 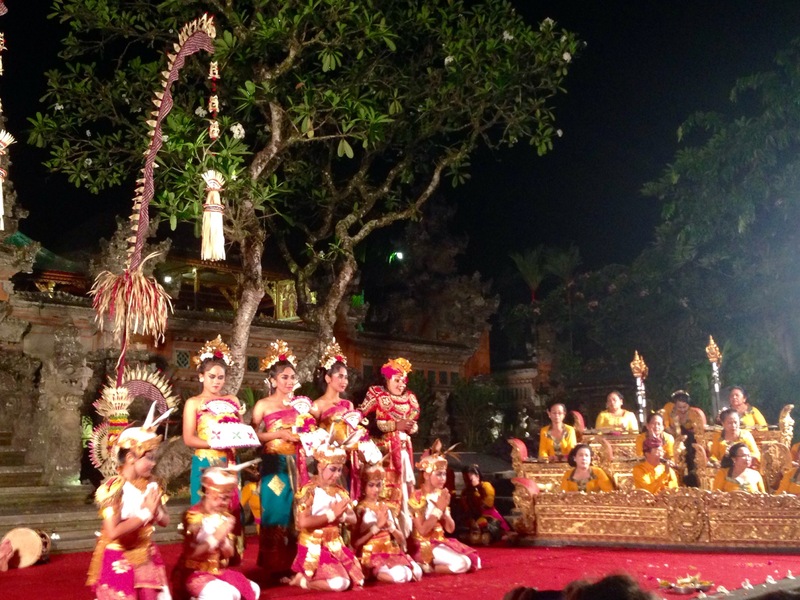 Lastly, another great activity we did which I think is a must-see in Ubud, is seeing a traditional Balinese dancing show. We got our tickets for $8 and the show went for 1 hour. There were ladies playing traditional music and other ladies dancing a strange, but traditional dance wearing impressive costumes and bold makeup. Unfortunately for us it poured with rain as we sat and watched the show without any cover, but this didn’t stop us from enjoying ourselves. 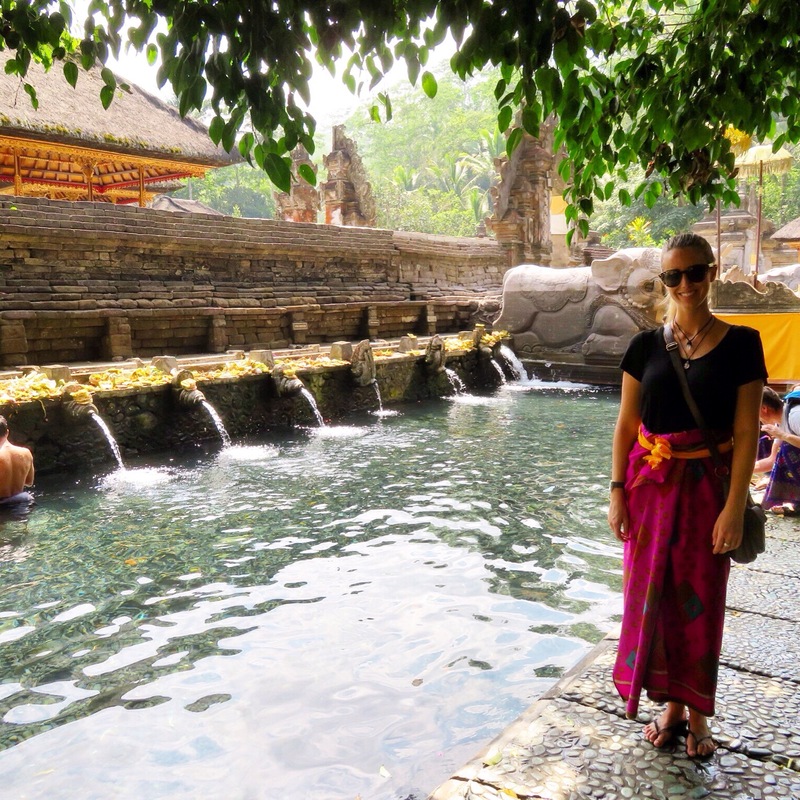 I really felt like I learned a lot about Balinese culture in Ubud. It’s still quite a touristy place but there is plenty of culture and tradition to help you get an authentic Balinese experience that you wouldn’t find in places like Kuta in the south of Bali. Four days just wasn’t enough here and I would go back in a heartbeat!